99% of the lunches I eat are in front of my computer. Isn’t that terrible!?! Not just a little commentary on my state of social habits, but imagine the state of my keyboard. Gross. 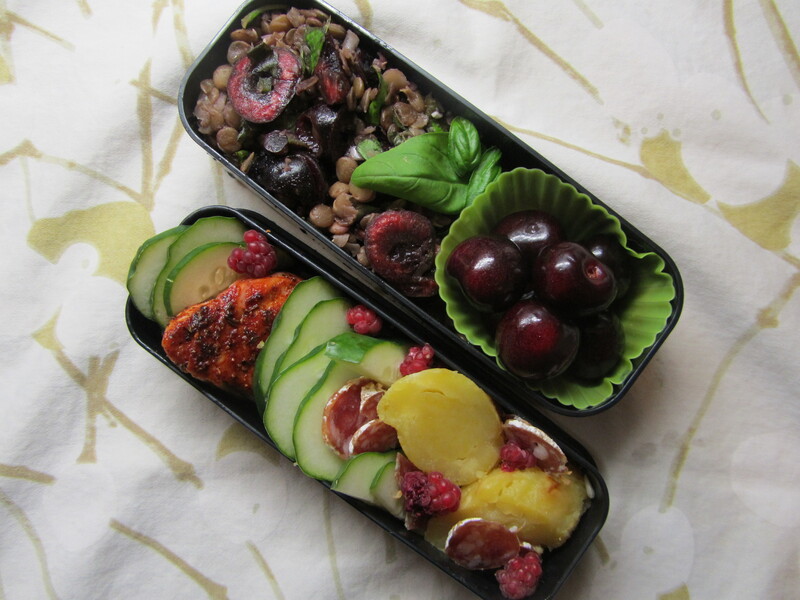 bottom box: Sliced cucumber, Alaskan King Salmon with Rub with Love (the easiest way to make anything grilled taste out of this world), roasted sweet potato, Olympic Provisions sliced salami, and raspberries from our yard. this bento was so lovely, but when I took it out to eat, everything smelled like salmon. Dislike. Any tips for packing stinky foods so they don’t stink up the whole lot? PUBLISHED ON July 19, 2011 by Maryin Bento! Where do you get your bento containers? I love the way this looks–it’s so beautiful! I would get excited about lunch (eating and making it) if this is what it looked like. Olympic Provisions is great. Cured meats, cheese and baguettes is mine and the Hub’s go to for meals (add in a glass of wine and it’s perfect-o). Have you had salami from Salumi (based in Seattle, made by chef Mario Batali’s father)? Their mole salami (spiced with chocolate, cinnamon, chipotle peppers) is absolutely amazing. You can get it at Foster and Dobbes in NE Portland. Drool. I got this one at Uwajimaya in Beaverton, it was my birthday gift to myself. Nice. I’ll have to check out their wares next time I’m at Uwajimaya. Have you gone to Fubonn Market on SE 82nd and between Division and Powell? It’s my fave store for finding Asian ingredients. They have a huge produce section that is super awesome. yes! I love Fubon! I go there a lot, but I really love Hi-Mart. Have to get my ban-chan fix.